Knipling’s Festival 2016 in Tonder…. In the years 2013 and 2014, the designer and lacemaker Jana Novak carried out in Barcelona, organized by the “Catalonian lacemalers Association” two workshops on Design and Technique applied to the creation of lace in clothing. During the workshops, she invited people participating in the workshops who had made their own designs, to participate in the Fashion Show that she had to organize within the Knipling`s Festival in Tonder 2016. The Fashion Show, which I have had the occasion to attend, was completed in a festive atmosphere since 3th to 5th June, with the assistance of lacemakers from Australia, England, Germany, Denmark and Spain, among others. Encarna Gonzalez from Alicante with two pieces, and Carolina de la Guardia from Barcelona with four pieces, were the Spanish lacemakers that participated with their designs at the Fashion Show, along with other designers from Denmark, Czech Republic, Slovakia. (Birthe Nielsen, Darina Lichnerova, Slavka Losova). The models presented by Encarna Gonzalez, were a poncho made of wool yarn different textures and colors, using the technique of tape lace. The very flattering shaped pattern in “V”, could be positioned so the pointed endings fall down by the sides. The second piece is a long opened vest, modern lace style made with linen and other fancy yarns in different colors worked on a geometric drawing, finished off with some beads in the fringe. Carolina de la Guardia participated with a vest worked with fine wool and thick fancy yarn in natural colors, using assorted stitches in the bands that compose the piece shaped in “V”, both on the front and the back, and buttoned with a fancy large button on each side. A second piece made with cotton thread in ecru color, with bands decorated with different stitches and arranged vertically side by side. A wider band, with openwork floral designs in green and yellow colors, on its front and back, gave an ethnic style to the top. The bottom of the piece was finished off in sharpened points. Some buttons of different colors completed the ornamentation. She also presented a fancy modern shawl, whose design consists of some stems with leaves that intersect between themselves. Meander tapes withspiders and an openwork ground with tallies complete the design. The yarns used were viscose and wool, in light colors: ecru, grey, pale green and pale blue.Finally, a summer stripped top, made with viscose yarn, gray, green and ecru colors combined. Both the front and back are composed of two differentiated parts. The two symmetrical parts on the sides were worked in a continuous and bias band made with “chaos stitch”, resulting in a mixture of different colors with dominance of green. The second part of the work, so on the front as on the back, was made as a continuous band with linen stitch, with decorative motifs diamond shaped here and there. The bottom of the piece was irregular and point shaped. Slideshow of the Fashion Show . Although I did personally, I would like here to thank publicly Jana Novak by the confidence dispensed to Spanish lacemakers, giving us the opportunity to participate in the prestigious “Kniplings Festival” in Tonder and place Barcelona and Spain in the lace world. 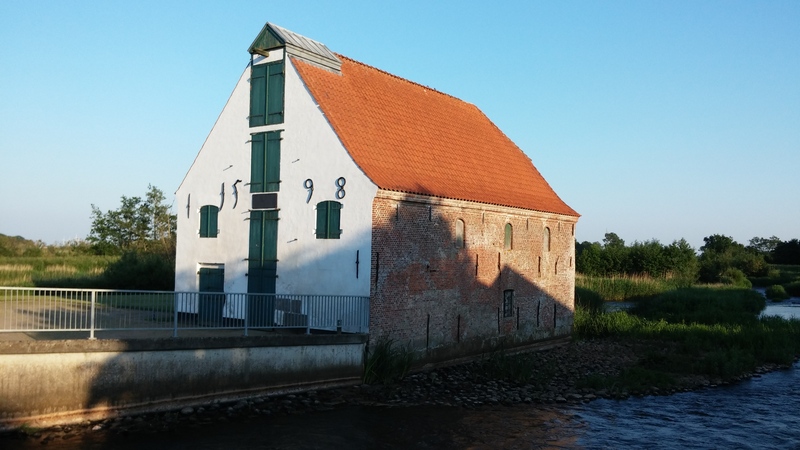 The charming little town of Tonder, located in the south of Denmark and along the border with Germany, warmly welcomed all the visitors participating in the “Kniplings Festival”, and in the widest sense of the word, because we absolutely enjoy of a summer weather. The great beauty of its architecture, and dedication by its inhabitants, in decorating their windows, they provided a romantic air to its streets.The organization had arranged exhibitions in different places especially outstanding for its antiquity, as DE VISEMOLLEN from the sixteen century. The work with willow bark, and the path towards the book comes from the summer of 2007. 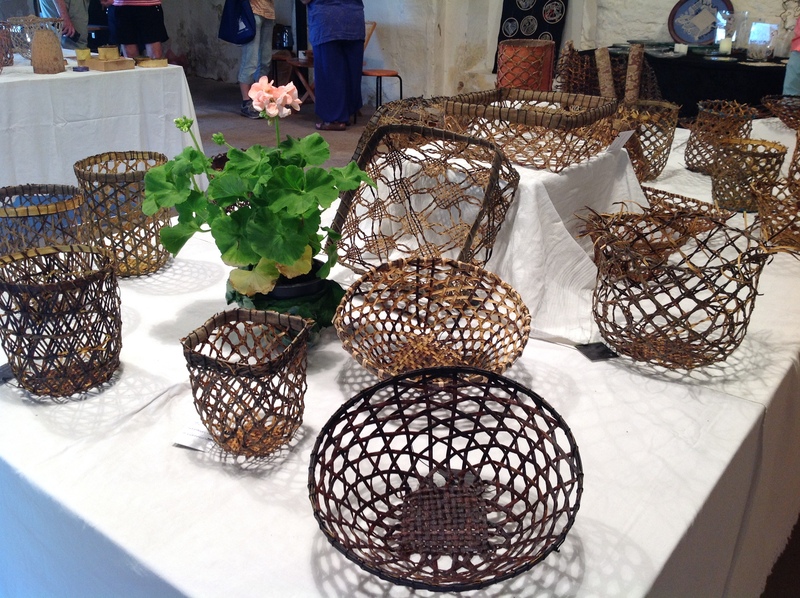 A course with Anna Maria Vaatainen and a trip to Finland, gave the authors the idea of bobbin lace made with rush stalks. No pins or patterns are used and the basis on which works is usually a wooden mold or polystyrene with the chosen form. Located near the Old Mill, the structure would have been part of the old Castle Tonder, which was demolished in 1751. You can still see inside the tower, the remains of what was Tonder prison, today a museum. 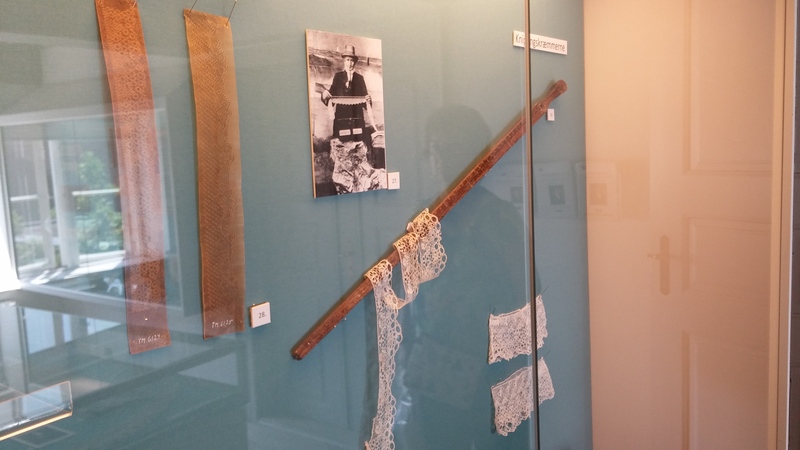 The Tonder’s Culture Museum, hosted a magnificent and varied exhibition of Vologda (Russia) bobbin lace . Stunning pieces, as a fully worked bobbin lacetable linen, an umbrella, and several dressing garments, jackets, etc. Follow a slideshow.. In Storegrade street, 14, we find “Drohses Hus” building built in 1672, and today converted into an annex to the Museum of Culture of Tonder, where a permanent exhibition of textiles and Tonder laces and its history are shown. Laces in Tonder evolved since about 1600s to 1800s. 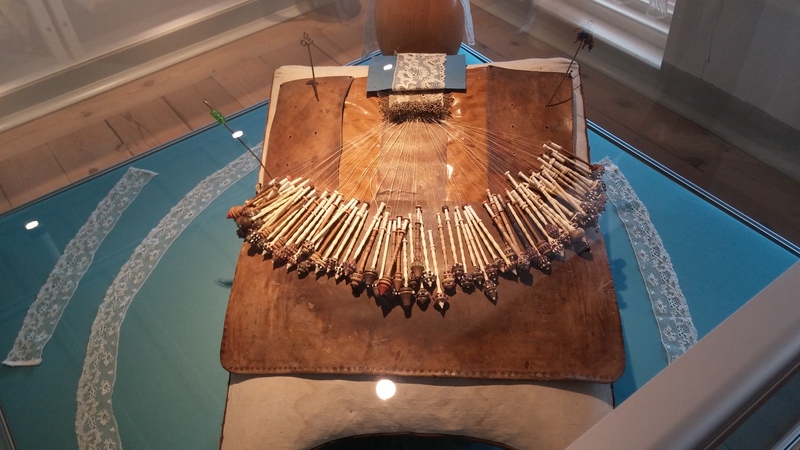 It is not known certainly how and when the craft of lace making came toTonder, but there are indications that it came there through the trade connections with the Netherlands and Flanders. The earliest written sources about the lace production in this area are from 1595.
industry already at this time. A portrait of Christian IV(1588/1648), depicts the king in a noble renaissance dress decorated with laces. It is known through letters, that the Royal House bought laces in Tonder. He drew up luxury regulations, which forbid the upper class to use foreign laces. The fragile and delicate laces worked in Tonder’s area, was made with very fine and thin linen thread. The bobbins were either shaped round or conic and were often decorated with beads, which protected the bobbins from wearing out. About 1700s, the style of laces was those of Binche. The type and inspiration came from Flanders and the town of Binche, close to the French border. Binche laces suited the dresses of the late Baroque and Rococo, which were inspired at that time from Dutch fashion. 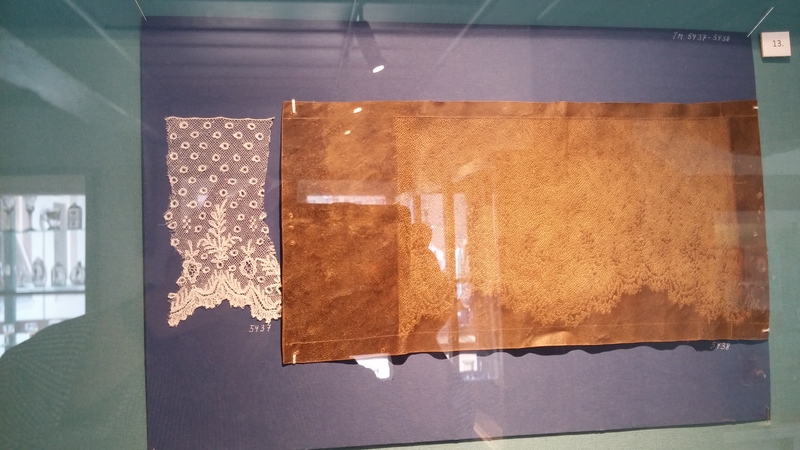 At the end of the 1700s and the beginning of the 1800s, fashion changed and new lace patterns turned up. Although Flemish laces were still models, French and English laces slowly took over. In the period from 1830 to 1850 a lot of lengths of Tonder laces were made, sold on markets all around the kingdom.